The mutual admiration between actor Jack Nicholson and director Michelangelo Antonioni resulted in the compelling psychological drama "The Passenger". Jack Nicholson, in one of his finest performances, plays David Locke, a disillusioned American reporter who is sent on a grueling mission to North Africa. 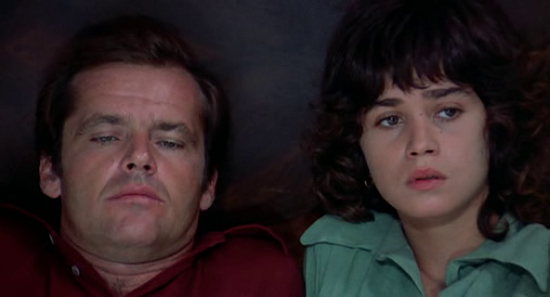 Released in 1975, 'The Passenger' is one of the deepest, most rigorous, and most rewarding films of its era. In an age increasingly obsessed with the self, the movie pulled the rug out from under its main character's very identity, asking us to consider whether a man's name or his actions outlast him. This may be the first existentialist star vehicle, and it is mesmerizing. David Locke (Jack Nicholson) is a television journalist making a documentary film on post-colonial Africa. To finish the film, he is in the Sahara desert seeking to meet with and interview rebel fighters involved in Chad's civil war. 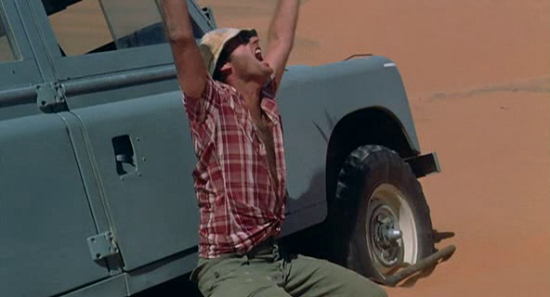 Struggling to find rebels to interview, his frustrations reach a climax when his Land Rover gets hopelessly stuck on a sand dune. After a long walk through the desert back to his hotel a thoroughly glum Locke finds that an Englishman by the name of Robertson (Charles Mulvehill), who has also been staying there and with whom he had struck up a friendship, has died overnight in his hotel room. Locke switches identities with Robertson; he is tired of his work, his marriage and his life, and senses an opportunity to start over. 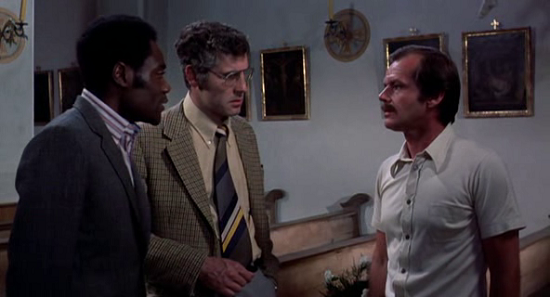 Now, posing as Robertson, Locke reports his own death at the front desk, where the hotel manager mistakes Locke for Robertson, and the plan goes off without a hitch. Back in London, David's estranged wife (Jenny Runacre) is roused from her affair with a younger man (Steven Berkoff, the villain of ''Beverly Hills Cop" back when he had hair) by the mystery of her husband's vanishing act; she dispatches David's film editor Martin (Ian Hendry) to talk with this Robertson fellow who reported the death. And of course it turns out that the corpse had a very vibrant life, one that involved political idealism and the risks involved in acting upon it. Robertson's daybook in hand, David returns to Europe to follow the strand of the dead man's future wherever it will lead. To his distress, he finds it leading toward a greater commitment to the world. Locke fears this even more than he fears the men on Robertson's trail. Locke soon discovers Robertson to have been gunrunning for the rebels he himself had been trying to contact in the desert. When he goes to check-out an airport locker listed in Robertson's diary, Locke is tracked down by the rebels' point man in Europe, who is there to finalize the weapons sale. Since neither man has ever seen the other before, Locke is able to escape the meeting without being discovered and ends up receiving what is the first down-payment in cash for the apparent arms deal Robertson had already set up before his death. Later Locke accidentally spots Martin on a street in Barcelona, as the latter tries to track Robertson down on behalf of Rachel. Locke backtracks quickly and at this point bumps into an architecture student (Maria Schneider) while trying to hide nearby. He asks her to fetch his belongings so he won't be seen at his hotel, where Martin has apparently camped out in order to catch up with "Robertson". 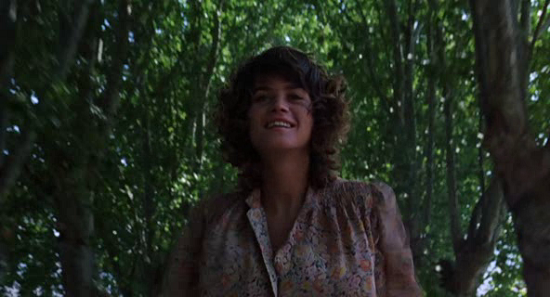 She sneaks past Martin, and then stays with Locke as he drives off from Barcelona. They become lovers, as Locke confesses that he has stolen a dead man's identity while trying to explain his recent behavior. Locke is flush with cash from the down payment on the arms he cannot deliver, but is nevertheless drawn to keep the meetings listed in Robertson's book. In the meantime, Rachel has received Locke's belongings that have been flown back from Africa. Having heard from Martin of his unsuccessful chase of the evasive "Robertson", Rachel receives a shock when she opens Locke's passport, only to discover the photo of Robertson pasted inside. She now realizes why "Robertson" is being so evasive, and heads off to Spain to track Locke down herself. Locke now begins fleeing from the Spanish police, whom Rachel has brought in on the search for Robertson, but the Girl is loyal and helps him evade them, providing rational advice. Locke sends the Girl away on a bus, saying he'll meet her in Tangiers later. There onwards the tale takes precipitous turns and revealing moments. Alas, Locke's attempt to reinvent himself—a casting off his actual self in favor of a fantasy self—is a fool's game, as his shouldering of Robertson's business schedule, commitments, and lifelong baggage proves to be less of an escape than the same dreary prison by another name. "I want to inquire about flights" are Locke's first words after "becoming" Robertson, and throughout the film his odyssey is cast as a flight from the past, whether it be a shot of Locke obscured by bird cages while running from his TV producer Martin Knight (Ian Hendry), a sterling view from the back of Locke's speeding car, or the startling overhead image of a euphoric Locke, his arms outstretched like wings, dangling above the ocean from a gondola lift. Nevertheless, when an old man nearby kids tells Locke, "When I watch them, I just see the same old tragedy starting again," the existentialism-laden film makes clear that the path to the grave is inescapable, regardless of the clothes one dons or the surname one adopts. 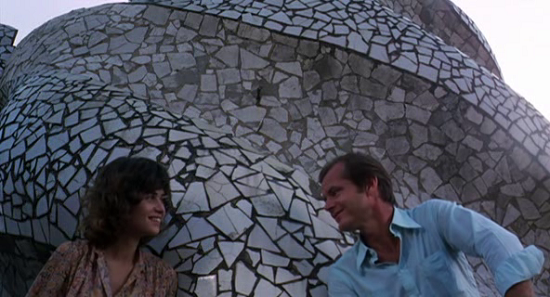 In "The Passenger", the only motif more omnipresent than doubling of personality is that of spirals (sand swirling in the wind, spherical tire marks in the dust outside Locke's ultimate resting place, a spinning fan, or Antonioni's twisting camera maneuvers), a coiled pattern which speaks to the fact that the circle of life, despite one's earthly deeds, ends right where it begins: with nothingness. Like all of Antonioni’s films, "The Passenger" too uses space, emptiness and architecture to create a sense of spiritual longing in an existential void. The film’s final scene is considered to be one of the great cinematic achievements in the history of the medium—a seamless tracking shot that moves through a gated window enters a courtyard and does a 180 pan and returns to the window from the opposite point of view from which it left, no edits. It was quite some time after the film was released that the method in which it was done became known to film buffs who had been baffled by Antonioni’s seemingly impossible feat. This film is indeed a fatalistic tale of identity, destiny, coincidence, existential malaise, and the boundaries between the real and the imagined, pensive examination of the deceptive and an examination of the destructive sway that dreams hold on their creators derives its magic from a deliberate inscrutability. As it hurtles toward its climactic moment of transcendent liberation, "The Passenger" offers only answers that lead to more questions, its larger meaning(s) as open to interpretation as the vast Saharan desert that provides the film's initial setting.